It’s 5:30PM, the kids are hungry and I’m starting to feel like a contestant on Food Network’s Chopped. I need to make a dinner for five out of whatever I can find in my refrigerator and pantry stat. I haven’t been to the supermarket in nearly a week and all I have is pork tenderloin, some carrots, Israeli couscous, a couple of onions, plus whatever spices and staples I normally have on hand. I could go to just about any recipe site and start looking at all of the pork tenderloin recipes. But it’s a frustrating process when so many of the recipes require ingredients I don’t have. 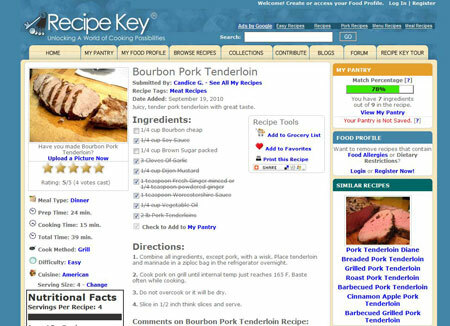 That’s where sites like SuperCook, Recipe Matcher, Recipe Key and Yummly come in handy. I just enter in the ingredients I have on hand, and they give me a matching list of recipes. My favorite of the sites is SuperCook because I can store the staples I keep in my kitchen—butter, salt, tomato paste etc. – so I don’t need to re-enter them every time, which saves me time. And if I happen to be out of tomato paste, I simply delete it from my pantry for that day’s search. There’s also an “Exclusions” list. I can select individual ingredients or whole categories, like all gluten, all nuts or all meat. SuperCook’s recipes come from professional chefs, so I find the quality tends to be the best. But SuperCook.com isn’t perfect. For instance, I got pork chop, sausage and pork roast recipes mixed in with the pork loin recipes. But there are plenty of recipes to choose from, and I quickly narrowed by choices to the Pork Tenderloin with Mustard Sauce from marthastewart.com and Roasted Pork Loin with Rosemary and Garlic on recipezaar.com. If an ingredient isn’t in my pantry, it will appear in a list below the recipe name so there won’t be any surprises. 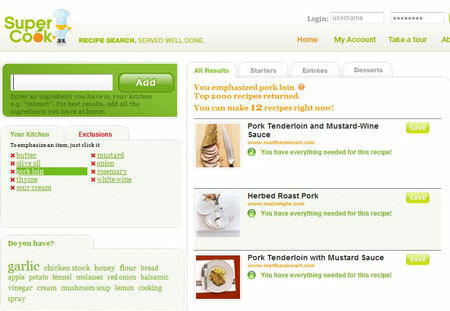 Two other great recipe sites that let you store your pantry online are RecipeMatcher.com and RecipeKey.com. You won’t find recipes there from well-known pros though. They’re set up to let you store your own recipes and search recipes from other home cooks. For pro recipes without the pantry option, I turn to Yummly for its unmatched ability to deliver recipes that meet my exact needs. In addition to including and excluding ingredients (including allergens), you can sort by diet (vegan, pescetarian, ovo vegetarian), Nutritional value (fat, calories, cholesterol, carbs), prep time, cost, taste (movable sliders for salty, savory, sour, bitter, sweet), type of cuisine and sources (Epicurious, Food Network, Martha Stewart). So what ended up on our plates for dinner? A slight variation on Martha Stewart’s Pork Tenderloin with Mustard Sauce, some carrots with butter and dill and Israeli couscous with a little butter, onion and chicken stock. Not bad for a Wednesday night. I just read your article and thought I would comment and provide an additional resource that we at foodGizmo have created. 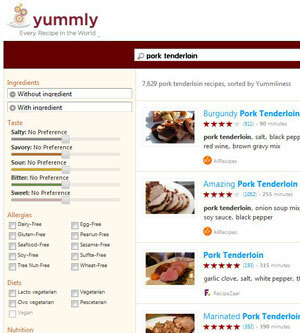 Our recipe tool is called foodGizmo, http://www.foodgizmo.com. We too search across the top sites and allow you to search for recipes that meet your needs, by ingredients, 5 ingredients or less, cook time, prep time, recipe site source to mention a few. But we also offer the users the ability to save these recipes, share them with friends, and create grocery lists within their own recipe box - a one stop shop for everyone’s recipe needs. This was a great post!Super Cook saved my life with the Dijon Mustard Pork Chops last night. Four ingredients, twenty minutes, and even my picky eater liked them! It may not have the sophistication of some of the sites above (and I visit Yummly quite often), but if you are looking for some great chili recipes, try out some at http://www.authenticchilirecipes.com. I haven’t tried the other two sites, but will check them out. And by the way, Martha Stewarts Pork Tenderloin with Mustard Sauce sounds pretty good!